On September 4, 2015, at 20:00h, Cudeca Foundation will be present at the opening of the Visions of Land and Sea art exhibition, organised by Peter Visser in aid of Cudeca Hospice. 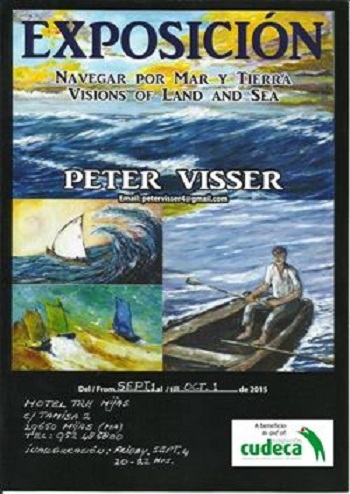 The opening will take place at Hotel TRH in Mijas, and the exhibition will be open during September. Half of the proceeds from the sale of paintings will benefit Cudeca Hospice directly. For more information, contact Peter Visser at petervisser4@gmail.com. The funds raised will go towards covering the costs of the free of charge home visit programme, the in-patient unit, the day unit, and rehabilitation that are carried out each day, in which Cudeca Foundation assists more than 900 people a year with cancer and other incurable illnesses in an advanced stage as well as offers help to their families in the province of Málaga. Cudeca Hospice's Traditional "Light the Light"